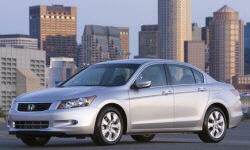 Why the 2010 Honda Accord? After owning and repairing many European cars, it is comforting to know that the Accord is much more likely than not to have extraordinary reliability and durability. It is a calming feeling. For a ubiquitous family car, the steering is fantastic. The ride is well-damped, sometimes choppy, but it seems to have a good amount of travel; no crashiness. The handling is competent, reassuring, but could use better tires I think. Given the size of the car, particularly the interior room, the 30+ highway MPG is impressive. I consider anything over 30 highway to be economical enough for me. Another benefit is that around-town mileage is still decent, 26-27 mpg. Why Not the 2010 Honda Accord? Lumbar support is too aggressive, and it is non-adjustable in the LX model. I have gotten used to them, but they are nowhere near the same league as my previously owned Saabs and BMWs.